To honour his belief that education and dialogue advance positive social change, philanthropist and Jeopardy! 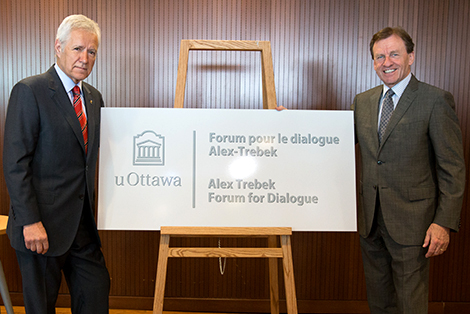 host Alex Trebek has donated $5 million to uOttawa for a new program to stimulate discussion and debate about society’s pressing challenges. Trebek, who graduated from the University in 1961 with a degree in philosophy, has designated his gift to create the Forum for Dialogue. The new program is designed to expose students to a wide range of diverse views, through speeches, public panels, events and lectures by uOttawa researchers, senior government officials and guests speakers from around the world. Introducing Nobel Peace Prize Laureate Leymah Gbowee, who spoke on May 6 as part of Alumni Week, Trebek said that during his student years at uOttawa, he learned the importance of honesty, respect for others and the value of hard work. Then, for the past 27 years, he has learned equally important lessons from his wife, Jean. “She has taught me the value of looking outside of yourself in a charitable way, helping others either financially or personally — and never expecting anything in return,” said Trebek. The donation brings Trebek’s total contribution to uOttawa to $7.5 million. He hopes his latest gift will encourage others to contribute during the University’s $400 million Defy the Conventional fundraising campaign. “I wanted to start 2016 with a bit of a challenge, to get other people to think along the same lines and to contribute,” he said. The Alex Trebek Forum for Dialogue builds on the University’s Distinguished Speaker series, which had invited Gbowee, and which was made possible by an earlier Trebek gift. Trebek praised Gbowee for her refusal to stay silent and on the sidelines while her home country of Liberia was plunged into civil war, and while women and children suffered. Gbowee won the Nobel Peace Prize in 2011, along with Ellen Johnson Sirleaf and Tawakkul Karman, for promoting peace, democracy and gender equality. Gbowee and Sirleaf played pivotal roles in ending Liberia’s civil war in 2003. Their coalition of Christian and Muslim women also paved the way for Sirleaf’s election as president in 2005 — the first female head of state of an African country. 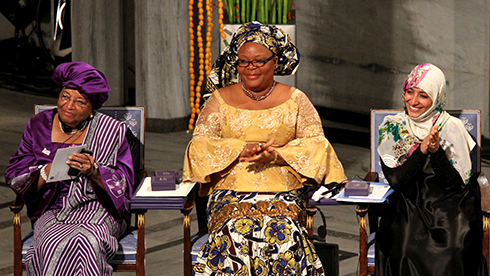 In her address, Gbowee stressed the importance of reaching beyond stereotypes, pushing past fear and establishing human connections on all sides of any conflict. “Since September 11, 2001, we have moved further away as a world from constructive engagement to fire for fire,” Gbowee told the audience of more than 700 people at Ottawa’s Shaw Centre. Gbowee threaded her hopeful talk with personal stories, both about the impact of conflict, fear-mongering and prejudice on people she has met in her global travels, and about the effects of the civil war on her own family. While she and her three oldest children lived in a refugee camp in Ghana, they nearly starved. The trauma that refugees experience means they often live in the moment of their traumatization, she said. She urged Canadians not only to accept Syrian refugees into the country, but to go further by “stepping out of your comfort zone” to get to know and welcome them. Without acceptance, divisions that fuel terrorism and conflict will remain, she said. To build peace in Liberia after 13 years of war, Gbowee and the other women she worked with bared their souls to one another, becoming vulnerable so they could rediscover each other’s humanity, she said. “Over the period of a year, we got to that place where we concluded the bullet doesn’t know a Christian from a Muslim. A woman being raped is never asked her religion. The cry of a mother when her child dies is the same in a Christian home as it is in a Muslim home as it is in a socially elite home as it is in a poor home,” Gbowee said. In a question and answer session after Gbowee’s speech, 11-year-old Kara Brulotte of Ashbury College asked Gbowee how to prevent the building of walls in the first place. The question earned her a hug from the Nobel laureate.